As discussed earlier, cloud motions vary according to height. But they may also vary from day to day, even during the day. Remember, there are flows within the atmosphere which are always changing. It is important to avoid using clouds in the background as reference points for other clouds. 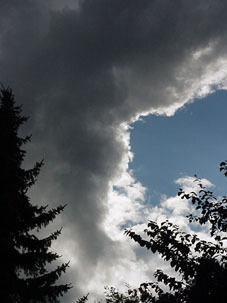 This is because the combined motion will tend to make other clouds appear to move in a different direction. If you don't know what this means, try it yourself. Always concentrate on the one cloud and remain as motionless as possible. It would be advisable to use a compass in order to determine direction bearings. This can also be done by referring to notable feature or structure as they relate to your location on a map. For instance, isolated hills, special buildings, straight roads, golf courses and other features are listed on most good maps and can also be used as reference points. It is not so important to be extremely accurate with bearings. The eight points of the compass are sufficient: N, NE, E, SE, S, SW, W, NW. Always note the direction in terms of the cloud's motion: "it is approaching from the SE", or "it is moving away towards the NW". If the cloud is slow moving, its direction may be too difficult to determine using the method above. In this case, it may be useful to observe the cloud's motion in sequences of about 5 minute intervals. You can use this technique especially when observing slow moving cloud associated with thunderstorm development. Consider the following example using the roof of the house and the tree as a guide. The thunderstorm base is observed moving from left to right. Another technique which can be used is the movement of shadows of the clouds. This is only applicable on days with sunny periods. It is preferable to observe the shadow from a distance of at least a few hundred metres. 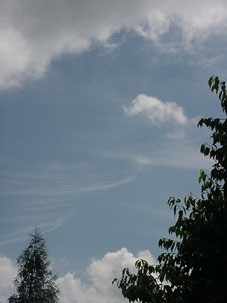 The lower fast moving clouds also tend to move in the direction of the wind. Since they are relatively close to the surface, they can be used to determine the approximate direction of cloud movement.